Depending on the criteria selected, the logged user can see what has happened in the case: The sequence of the activities, the modified data grouped by entities, the Users involved in the case, the information they modified and the activities they executed. The State log by activities displays the sequence of activities performed by the case, in a chronological order. It lists the name of the initial task, then subsequent task, the user who executed and the time of execution. Click the Details link, in the Activity Log, to see the data modified during the execution. In this view, you will find the set of attributes that were affected in the Activity chosen. It lists the Entity that each attribute belongs and the value given by the user. The State log by Entities shows the history of changes of all the attribute's that have been affected in the case. Initially, the list of entities that contain such attributes is displayed. By drilling down to any of the Entities you will see the list of the attributes that have been modified, within that Entity. In the Entities detail log you will find a list of all attributes within that Entity that have been modified. These are listed alphabetically. If a single attribute has been modified in more than one activity, it will be displayed as many times as it changed. The log shows who changed the attribute, the name of the task and the date of the modification. Notice you can also filter the information by attribute or by user, entering all or part of the name of the attribute or the user. 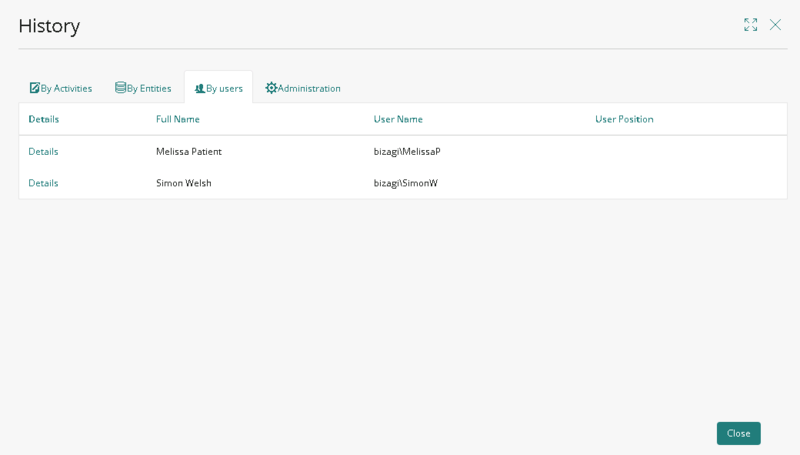 In order to use this functionality you must configure which entities are to be logged, in Bizagi Studio. 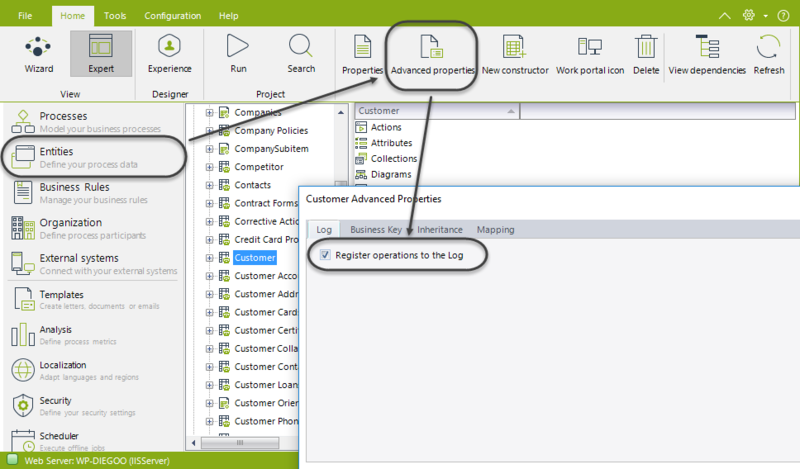 In order to do so, enter the entity’s Advanced Properties and select Register operations to the Log option. 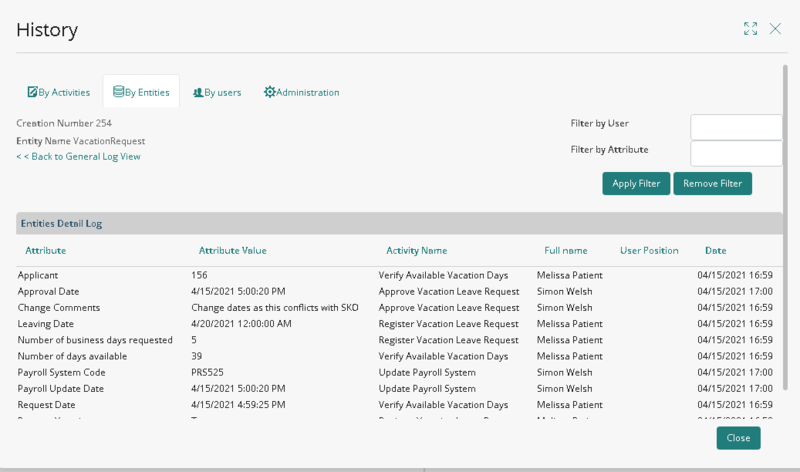 The State log by user displays the users that have participated in the Process. When clicking on the details link in this log, you can see each of the entities and attributes modified by that user. 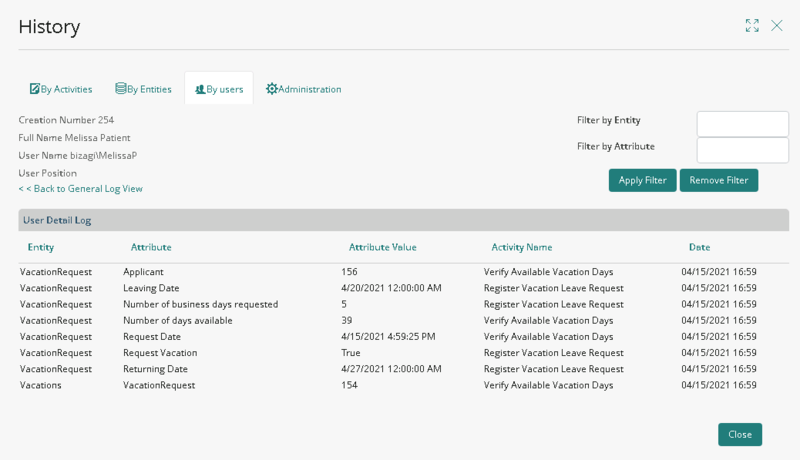 Inside each record you can see the name of the entity, the display name of the attribute, its final value, the Activity where it was modified and the date. In this view the information can also be filtered by entity or attribute, including the attribute or user name completely or partially. The State Administration displays the history of the actions performed by Bizagi administrators during the case. This state is only displayed to Administrators. •Case or activities reallocation depicted by . 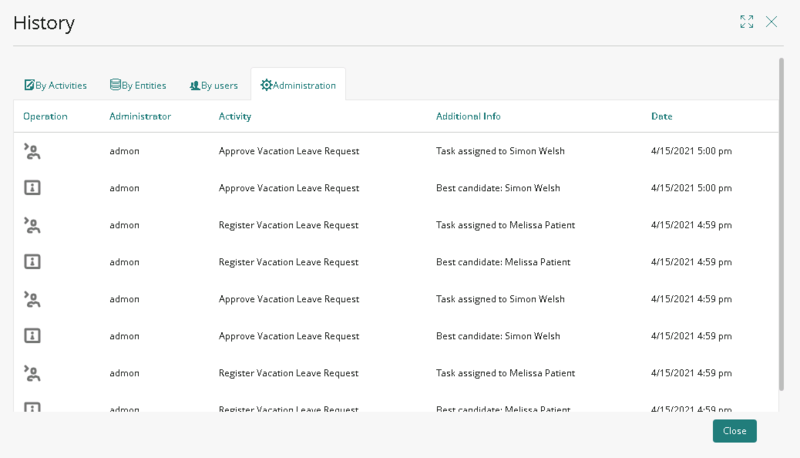 When this action is displayed, the additional information shows the initial and new task assignee. •Case invalidation depicted by . When this action is displayed, the additional information shows the reasons of the case invalidation entered by the administrator who performed this action.